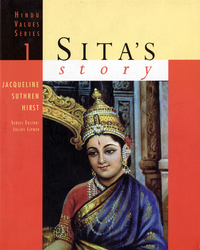 Series Editor: Professor Julius Lipner, The Divinity School, University of Cambridge “Sita” is an ideal, an inspiration, an icon. Aimed primarily at high school students, this book may surprise many adults with its balanced, contemporary interpretation from one of the greatest cultural epics of all time, the Ramayana. This is the first volume in ‘INDIC VALUES SERIES’ published in collaboration with the Divinity School, Cambridge University.